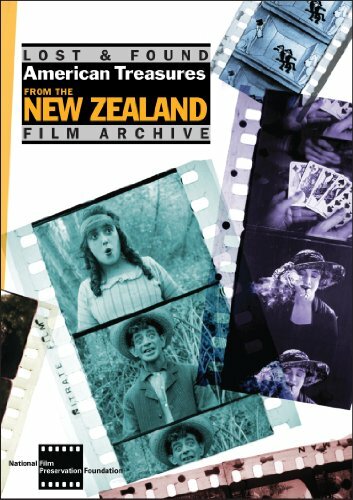 Lost and Found: American Treasures from the New Zealand Film Archive (Silent) by Image Entertainment at Chocolate Movie. MPN: 11241555. Hurry! Limited time offer. Offer valid only while supplies last. Long-lost films by John Ford, Mabel Normand, and Alfred Hitchcock are brought back to life in LOST AND FOUND: TREASURES FROM THE NEW ZEALAND ARCHIVE. Long-lost films by John Ford, Mabel Normand, and Alfred Hitchcock are brought back to life in LOST AND FOUND: TREASURES FROM THE NEW ZEALAND ARCHIVE. Treasures New Zealand draws from the extraordinary cache of nitrate prints safeguarded in New Zealand for nearly a century and preserved through a groundbreaking international partnership led by the National Film Preservation Foundation. None of the DVD’s films have been seen before on video; in fact, none were even thought to exist just four years ago. Treasures New Zealand includes a 56-page illustrated catalog with forewords by Leonard Maltin and Chris Finlayson and program notes by Scott Simmon and David Sterritt; more than 180 interactive screens; new music created by Michael D. Mortilla and Donald Sosin; and a music video extra. The disc was digitally mastered and produced from the only source materials known to survive. That films lost in the United States came to be found 7,000 miles away speaks volumes about the international popularity of American movies from the very start. By the late 1910s, American distributors circulated prints around the globe with the expectation that they would be shipped back or destroyed at the end of their runs. But some prints evaded destruction and made their way into public collections, like the New Zealand Film Archive. Today hundreds of American movies from the silent era that were not saved in the U.S. survive aboard. The Treasures New Zealand films can be shared today thanks to the generous stewardship of the NZFA, the preservation work directed by the Academy of Motion Picture Arts and Sciences, George Eastman House, the Library of Congress, the Museum of Modern Art, and UCLA Film & Television Archive, and the contributions of hundreds of donors. Net proceeds will support further film preservation.